The Nigerian president has said his government is ready to negotiate with any "credible leadership" of Boko Haram. 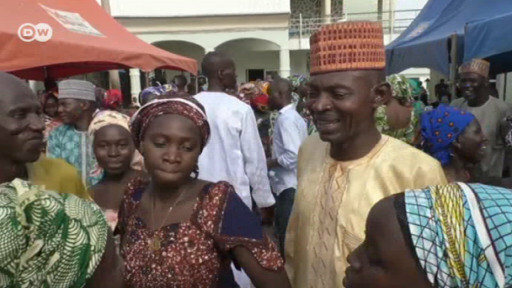 More than 200 girls were kidnapped from the town of Chibok in 2014, sparking global outcry. "We are prepared to negotiate without conditions with credible Boko Haram leadership," Nigerian President Muhammadu Buhari told reporters in a media chat broadcast on Wednesday. Nigeria's new President Muhammadu Buhari promised to stamp out Boko Haram by the end of December. Will he manage to keep his word? In April 2014, 276 girls were kidnapped by the Islamist militant group Boko Haram in the northeastern Nigerian town of Chibok, sparking headlines across the globe. While a handful of the girls were able to escape captivity shortly after being kidnapped, some 200 of them have not been seen since a video of them was released in May 2014. Buhari noted that negotiations could not begin until Nigerian authorities could confirm the girls are alive. "We are looking for a credible Boko Haram leadership that will confirm that the girls are alive," the president said. Buhari added that Nigerian authorities have no firm intelligence indicating their wellbeing or where they may be located, stating: "That is the honest truth." More than 17,000 people have been killed in the six years that the militant group has attempted to create an independent Islamic state in the West African country.